The collapse of an Ozarks Public Television tower in April that killed an engineer was caused by mistakes made by contractors, according to a report by the federal Occupational Safety and Health Administration. OSHA determined that TCI’s procedure for replacing the diagonals was flawed because the removal of bolts weakened the tower’s legs. Missouri State University, licensee of KOZK, had contracted with tower engineering firms Tower Consultants Inc. and Steve Lemay LLC to reinforce its 1,891-foot broadcast tower in Fordland in preparation for a new antenna. The station needed the new equipment to switch from Channel 16 to Channel 23 for repacking after the FCC’s spectrum auction. On the morning of April 19, Steve Lemay, owner of Steve Lemay LLC, and his crew were about 100 feet up on the structure, installing bracing to strengthen the tower for the new antenna, when the collapse occurred. Lemay was killed, and three injured crew members were treated and released from a local hospital. The October OSHA report and associated documents obtained by Current through a Freedom of Information Act request found that removal of key bolts during a bracing procedure led to the collapse. MSU had hired Tower Consultants Inc. to create construction documents, observe the process and help select a contractor. TCI advised MSU to hire Steve Lemay LLC to do the work. 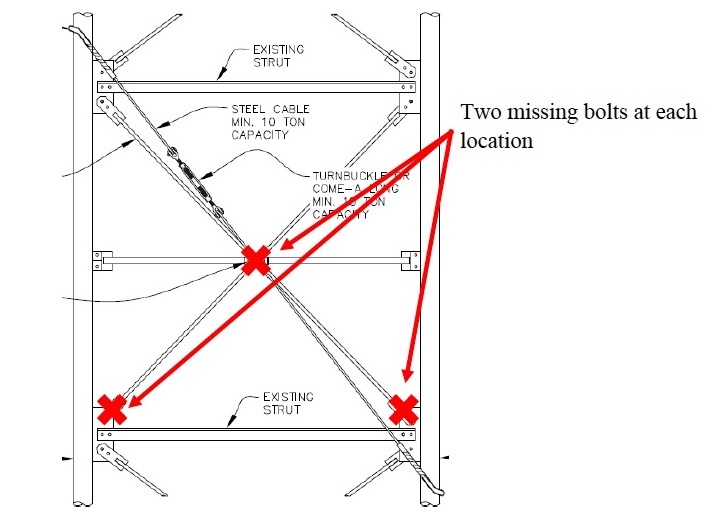 TCI suggested a replacement procedure for tower diagonals, which are X-shaped rods fastened to the tower’s horizontal framework. The procedure involved removing bolts on the diagonals. The report found that TCI’s suggested procedure for replacing the diagonals compromised the strength of the tower’s legs, causing the collapse. “It is critical that the tower legs are adequately braced while renovations or structural modifications are underway,” the report said. Investigators also found that a winch that Lemay used to remove braces was too small for the job. TCI could not be reached for comment. After the accident, KOZK began broadcasting a low-power signal from the MSU campus. In July, it transitioned to a medium-power operation from a leased tower in Fordland. The collapse also led to the shuttering of Steve Lemay LLC. The company “is not taking on new business” and most of its assets have been sold, Vincent O’Flaherty, an attorney for Lemay, told OSHA in an email Oct. 16. O’Flaherty said Lemay’s wife Carol will close the business Dec. 31. Current Digital Editor Mike Janssen contributed reporting to this article. I wish the FCC would listen to the NAB and realize the timeline for the re-pack is wildly unrealistic and it’ll never be finished that quickly.